HAPPY 2 MONTH BIRTHDAY, MY ANNABELLE!!! It’s been a very long, tiring, scary, but wonderful two months with my little Annabelle! 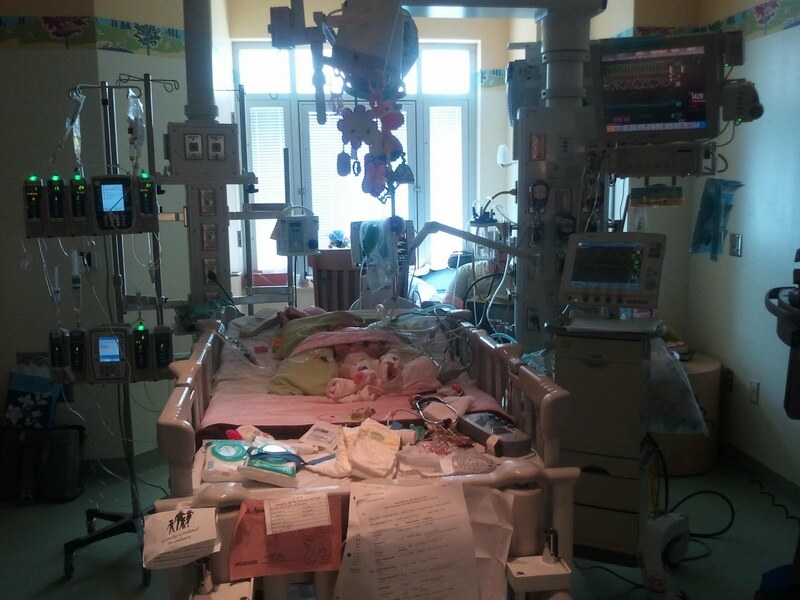 She’s had open heart surgery, almost didn’t make it three times where they had to revive her, and had to be intubated FIVE times. 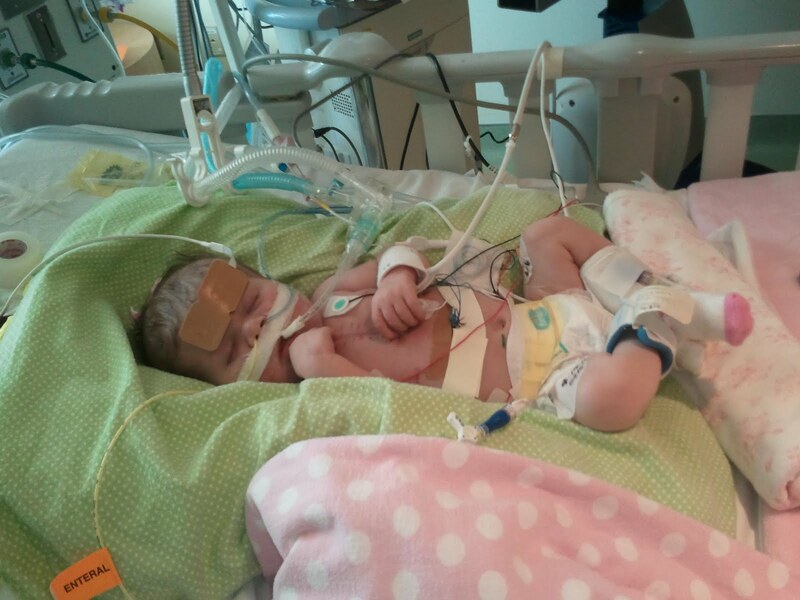 She’s had infections, leaky valves, stomach issues, and severe reflux. In other words, she is my TROOPER. Yesterday was her most recent extubation. She failed on Thursday after about 8 hours. Her lungs didn’t collapse this time (YEAH!) but her blood gas numbers were much, much less than stellar. 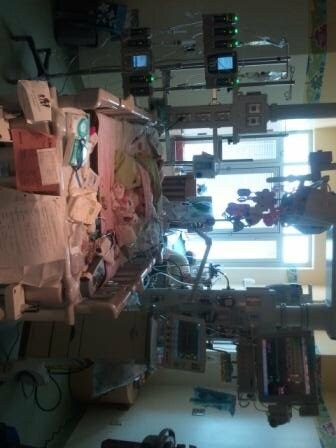 They tried again yesterday and as of this morning, she’s still off the vent and her numbers, while not perfect, are MUCH MUCH better! WOOHOO! She’s on her CPAP machine, which she does NOT like (and really, who can blame her??) but now I can at least hear her little baby-girl cries and talking! They are sad because they are so squeeky, but sweet none-the-less! Hoping to graduate to vapotherm or NOTHING soon! She is still scheduled for stomach surgery sometime this week, but no idea when. They aren’t feeding her because of her stomach issue (except for IV nutrition) so she’s started to loose weight again, which isn’t great. She’s still over 8 pounds, but she’d been over 9 at one point! The rest of us are hanging in there. I’m working 6 hour days and spending most of the rest of the time at the hospital. My in-laws are here at least for this week (my m-i-l has been here for all 9 weeks!) In the next few weeks, we’ll have to start transitioning to a more normal schedule as my in-laws leave, and I’m a wee bit scared about that. The few things I haven’t had to worry about were where my kids are, laundry, cleaning, cooking, and homework. I’m eeking by now just with the things I AM taking care of. Granted, my hubby will probably take on a good bit of that now, but please pray as we transition back to as normal of a life as we can! Many of you have asked about my Karalynn, Lacy, and Gabby. They are doing well. I think school helped to create some sense of routine too. They miss Mommy and Daddy though. My Gabby told Grandma the other day that things are all out of place— that Grandma and Grandpa should be sleeping at their house instead of her house, and Mom and Dad should be sleeping at home instead of the hospital. My heart about broke, because she is totally right. Things ARE out of place. And Annabelle should be at OUR house instead of at the hospital too! So, I’m praying mightily that things can get back to their rightful places. Here are a few pics of my Annabelle! And a little video too if I can get it to work…. Annabelle trying to talk after they took her off the vent! 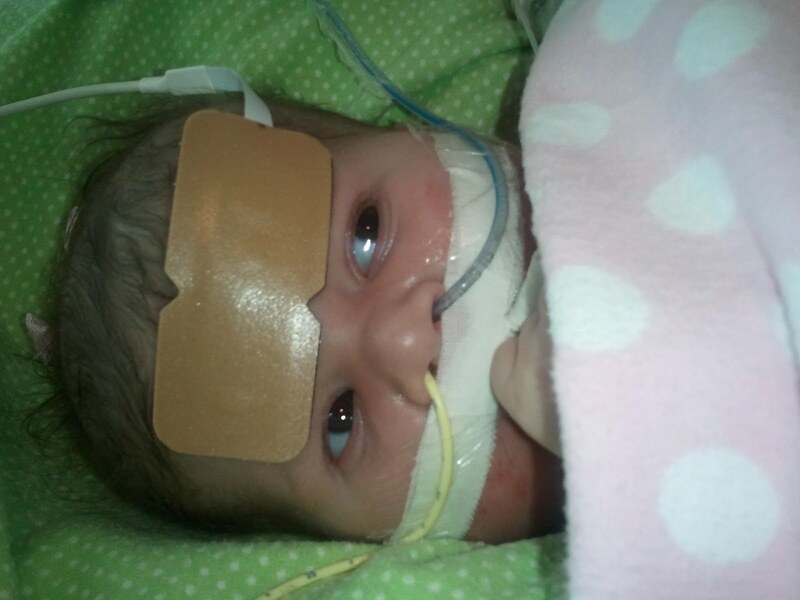 It leaves her poor baby throat sore so it takes her a while to get her voice back! Picture of Annabelle’s decorated door! 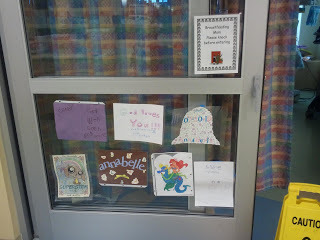 The girls each drew her a picture, and the nurses did a few scrapbook pages with her name for her! One nurse even colored her an Ariel picture! She’s in there somewhere… but this is a picture of her room and her crib! She REALLY wants that tube out! Really REALLY wants it out! And now it IS out! Soon, we should get that contraption off her too!! WOOHOO! I can't wait till she comes home and life is back to normal for you! 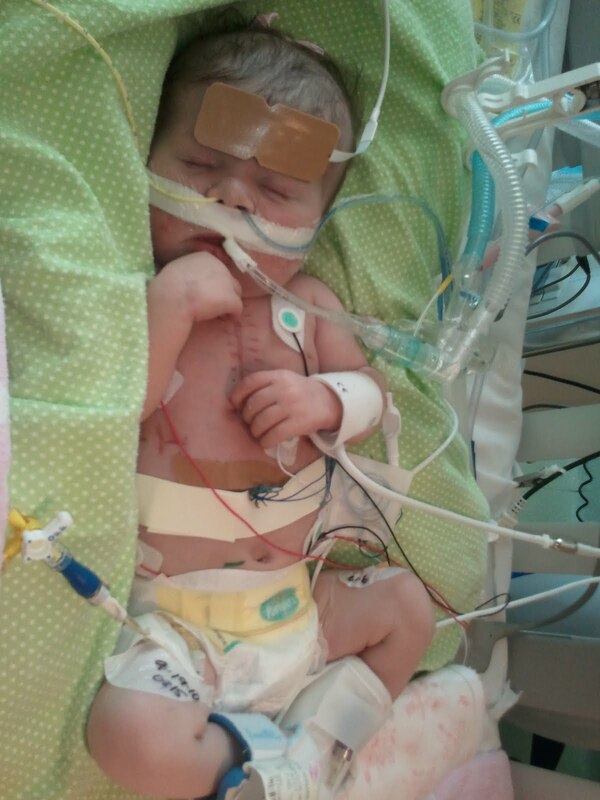 Praying hard for Annabelle. Happy Birthday, Annabelle. We're praying for you. Happy birthday Annabelle!!! You are precious. Praying for you, your mommy and daddy, and your sisters! Life will be so surreal when you get to bring her home and do the routine thing. Happy Birthday to a sweet little girl! Happy two month birthday, Annabelle!!! Simon is waiting patiently to meet you! Jackson and I loved listening to her little baby noises! Love ya, KP! You're doing great, Momma! Happy Birthday, Trooper! You are looking more and more beautiful every day! PRAISE GOD she is doing better! Though it just makes my heart ache to see her all tubed up, as I am sure it does you, ten times worse! Bless your MIL for staying and helping! Still praying! !